Is the Half Moon Bay police department budget too high? When I was in grad school my professors, mostly economists and policy wonk types, loved to use the phrase “first approximation.” First approximation this, first approximation that. It was used to refer to everything from an outright guess (without even the pretense of analysis) to a sort-of first pass look at a question, both to get a sense of what the answer might be and to see whether the result was interesting enough to warrant a deeper look. This second sort of “first approximation,” the kind I am utilizing here, doesn’t pretend to be highly refined–it isn’t. It also doesn’t pretend to be error-free. No doubt corrections can be made. The first chart looks at HMB’s police budget in terms of what it costs per person. Of course that’s not how it really works–the City gets money from all sorts of sources so people don’t actually pay this amount. But by breaking it down this way it gives us a useful way to compare the HMB police budget against cities with different populations. This second chart takes a crack at the question from a slightly different angle. Here we are looking at how big the police budget is compared with the overall city budget (general fund). The idea is to get a sense of whether the police budget is crowding out other spending. What jumps out at me in this comparison is that Half Moon Bay’s police budget is high both relative to the size of its population and to the size of its budget. More worrisome is that the budget continues to rapidly rise–another $500,000 or so is to be added to the police budget, changing HMB’s number in the first chart to about $417 per person. Yet looking at the police blotter there doesn’t seem to be a crime wave in the area or an expansion of police responsibilities that are commensurate with its drain on City resources. Yet this growth, which is placing great constraints upon the City–greater than any potential $30 million judgment–has taken place with little to no public discussion. This is a first approximation. Please send corrections and ideas for further refinement to us or discuss them in the Forum. Click here to download high resolution versions of these charts. Farallone View Elementary has a weekly after-school program for “gifted and talented” fourth and fifth graders. This year one of their projects is the production of Mufaro’s Beautiful Daughters, a sort of Cinderella story of African origin, complete with handmade masks and intricate drum rhythms. It is the story about two daughters and the making of a queen. It is also the story about students eager to learn. Farallone View isn’t a big money school like some of those over-the-hill. There is only a small budget to fund the gifted and talented program. The music director is part-time and paid for by fund-raising. The single microphone at the school cuts in and out to the point where it is barely usable. This is a situation where small donations can make a real difference. If you want to donate $5, $25, $50, or $100 to next year’s program please contact the school or click the “Donate” button above and indicate in the comments section that it is for the gifted and talented program and we will forward the money and work with the program to make the best use of it. If you would like to make a more significant contribution or if you’d like to sponsor the program contact us and we can discuss the program’s needs in more detail. In this third installment of his powerful video column, Neil plays a game with the viewer–sort of a cross between “Where’s Waldo?” and “Hide-and-Seek” as he continues to explore the rules that are changing our community and creating a new coast. Charting a path that is neither “no growth” nor “pro-growth” Neil highlights the absurdities of our current development laws and suggests a few new ideas. Don’t watch it if you are happy with the “Hatfields vs. the McCoys” nature of our politics here on the Coast, but do have a look if you think we can do better. Drowning. In a kayak it seem so easy with your body tucked way in there and the spray skirt holding tight. In this second installment of his video column Kenny Howell addresses this fear head-on with the help of kayak rescue expert John Lull (a resident of El Granada). 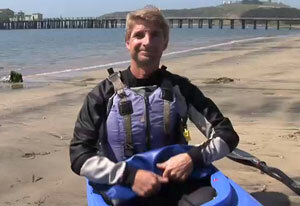 If the video doesn’t tell you all you need to know check out John’s book Seakayaking: Safety & Rescue. It’s the standard text in the field. On Sunday, my family and I went for a walk on Montara Mountain. On the way down my Mom spotted what looked like a miniature, rainbow-colored sun! My Dad identified it as a Sun Dog. As I looked closer at it I saw that there was a white, cloudy ball at the center. As we moved on I tried to keep track of both the Sun Dog and the Sun as we moved into a patch of trees. When we came out of the woods the Sun Dog had faded and all that was left were several bright wisps of cloud. 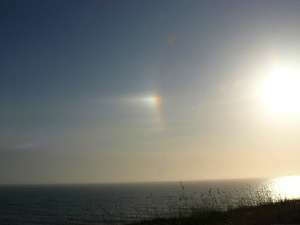 After we returned home I looked on the Internet and learned that Sun dogs are formed by the Sun being reflected off ice crystals, water, fog or mist in the air. They most commonly occur at sunset or sunrise. A good web page to learn more is at Wonderquest.